11th lunar month of 1691: Ugenji performs in Kyôto. 1694: Ugenji performs in Edo at the Nakamuraza. 1st lunar month of 1695: Ugenji goes back to Kyôto and plays at Hayagumo Chôdayû's theater the role of Ashiwara Ôenojô in Chikamatsu Monzaemon's drama "Ima Genji Rokujûjô". His stage partners are Mizuki Tatsunosuke I, Sakata Tôjûrô I, Yamatoya Jinbê II, Sodesaki Iroha I, Matsumoto Rokuemon and Arai Hanzaemon. 11th lunar month of 1695: Ugenji plays in Kyôto at Miyako Mandayû's theater the role of Hamamatsu Chikaranosuke in the drama "Hime Kura Daikoku Bashira". 11th lunar month of 1696: Ugenji plays in the same theater in the drama "Fukujumaru", which is produced by Yamashita Hanzaemon I. His others stage partners are Yoshizawa Ayame I, Kokan Tarôji I and Takeshima Kôzaemon I. 1st lunar month of 1698: Ugenji's rank in the Kyôto hyôbanki, wakashugata section, is jô-jô-kichi (superior - superior - excellent). 1st lunar month of 1700: Ugenji plays in Kyôto the role of Yamada Sanjûrô in the drama "Keisei Zen no Tsuna", which is produced by Yamatoya Jinbê II. The line-up includes the actors Yoshizawa Ayame I, Mizuki Tatsunosuke I, Hayakawa Hatsuse, Onoyama Ujiemon, Takenaka Kiyonosuke, Matsunaga Rokuroemon, Sugiyama Kanzaemon I and Fujimoto Heijûrô. 7th lunar month of 1707: Ugenji plays in Kyôto at Miyako Mandayû's theater in Fukuoka Yagoshirô's bon kyôgen "Nyonin Ketsuen no Kanchô". Fall 1707: Ugenji goes to Ôsaka. 11th lunar month of 1707: Ugenji becomes tachiyaku and plays in Ôsaka in the kaomise drama "Onna Daimyô Irekozan". 1st lunar month of 1708: Ugenji's rank in the Ôsaka hyôbanki, tachiyaku section, is jô-jô (superior - superior). He shares the same rank with Sugiyama Heihachi, Mikasa Jôemon, Yamamura Kazaemon, Arashi Sanjûrô I and Bandô Hikosaburô I. Fall 1710: Ugenji goes back to Kyôto. 11th lunar month of 1710: Ugenji plays at Hoteiya Umenojô's theater the role of Mitsunojô in the kaomise drama "Tagasode Ume Sakura Matsu"; his stage partners are Takeshima Kôzaemon I, Takeshima Takisaburô, Ikushima Jûshirô and Nakamura Sen'ya I. 3rd lunar month of 1711: Ugenji's rank in the Kyôto hyôbanki, tachiyaku section, is jô-(shiro)jô (superior - (white) superior). 3rd lunar month of 1712: Ugenji's rank in the Kyôto hyôbanki, tachiyaku section, is jô-jô (superior - superior). Fall 1712: Ugenji goes to Ôsaka. 12th lunar month of 1712: Ugenji plays in Ôsaka in the kaomise drama "Enmei Kobukuro", which is produced by Arashi San'emon III. 1st lunar month of 1713: Ugenji's rank in the Ôsaka hyôbanki, tachiyaku section, is jô-jô-(shiro)kichi (superior - superior - (white) excellent). He shares the same rank with Arashi Sanjûrô I, Takeshima Kôjûrô, Sugiyama Heihachi, Kaneko Kichizaemon and Sakurayama Shirosaburô I. 11th lunar month of 1713: Ugenji plays in Ôsaka at Shioya Kuroemon's theater the role of Terujirô in the kaomise drama "Yoyo Meoto Tsuru no Mago". 1st lunar month of 1717: Ugenji's rank in the Ôsaka hyôbanki, tachiyaku section, falls to jô-jô-(shiro)hankichi (superior - superior - (white) half excellent). He shares the same rank with Anegawa Shinshirô I, Ôtori Michiemon, Arashi Kanshirô I and Haruyama Genshichi I. Fall 1719: Ugenji goes back to Kyôto. 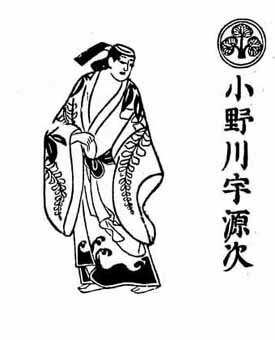 12th lunar month of 1719: Ugenji plays in Kyôto in Adachi Saburôzaemon's kaomise drama "Yamato Ôji Meoto Izumi", which is produced by Sawamura Chôjûrô I. 1st lunar month of 1720: Ugenji's rank in the Kyôto hyôbanki, tachiyaku section, is jô-jô-(shiro)kichi (superior - superior - (white) excellent). He shares the same rank with Arashi Sanjûrô I, Yamamura Kazaemon and Karyû Sawaemon. 1st lunar month of 1721: Ugenji's rank in the Kyôto hyôbanki, tachiyaku section, falls to jô-jô-(shiro)hankichi (superior - superior - (white) half excellent). He shares the same rank with Katayama Kozaemon and Yamamoto Hikogorô. Fall 1722: Ugenji goes to Ôsaka. 11th lunar month of 1722: Ugenji plays in Ôsaka the role of Toyohara Genzô in the kaomise drama "Tenchi Tennô Sokutai Guruma", which is produced by Arashi Kanshirô I. 1st lunar month of 1723: Ugenji's rank in the Ôsaka hyôbanki, tachiyaku section, is jô-jô-(shiro)hankichi (superior - superior - (white) half excellent). He shares the same rank with Arashi Kanshirô I. He plays in the same theater the role of Tezuka no Tarô in the new year ni-no-kawari "Keisei Tomoe Daiko". Fall 1723: Ugenji goes back to Kyôto. 11th lunar month of 1723: Ugenji becomes jitsuaku and plays in Kyôto the role of Kameyama Okinojô in the kaomise drama "Teono Hajime Kogane no Ishizue", which is produced by Segawa Kikunojô I. This is most likely his last kaomise in a major theater. 1st lunar month of 1724: Ugenji's rank in the Kyôto hyôbanki, jitsuaku section, is jô-jô-(shiro)kichi (superior - superior - (white) excellent). Ugenji plays in the same theater the role of Tomiyama Wadanojô in the new year drama "Keisei Futakamiyama". 1724 ~ 1727: Ugenji's name does not appear in any major theater playbill. 2nd lunar month of 1728: Ugenji appears on stage for the last time, in Kyôto at the Nawate no Shibai, playing the role of the young master Tsurujirô in the drama "Man'yô no Hana Nishiki no Akebono". Onogawa Ugenji was the most talented wakashugata of the Genroku era in Kamigata. He reached the heights of fame as a wakashugata from the end of the 1690s to the middle of the 1700s. He became tachiyaku but failed in reaching the prestigious jô-jô-kichi ranking.